Use the power of the subconscious mind to sharpen your learning skills. Enhance your mind's ability to absorb and comprehend information. Learning is 50% education and 50% experience. Learning skills are actually the ability to recall education. With a mind that can and does process 100 million messages per second, recalling bits and pieces of appropriate information can be challenge. Learning should be easy and fun. 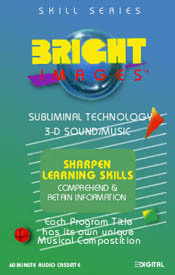 This program is designed to make learning easier, to assist your mind in processing information for easier recall. Helps your mind soak up information making it easier for you to recall your experience and learned knowledge, which will allow you to be more effective. Works on your natural abilities of learning and recalling information to allow a person to learn anything you want.